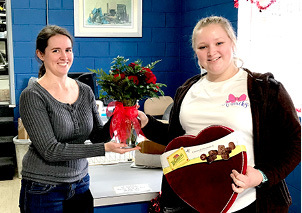 Kaitlin York’s name was drawn as the winner of the Clinton County News Valentine’s Drawing. She won one dozen beautiful red roses, courtesy of City Florist, and a huge box of Whitman’s chocolates, courtesy of Dyer Drug. Pictured with York is NEWS Advertising Manager Erika Roe. Thanks to all those who entered. Happy Valentine’s Day!